I'm writing this from a hotel in Mumbai. I'm in India celebrating my wife's 40th and my father-in-law's 70th birthdays. Over lunch, two things struck me: firstly, how collective and accumulated human experience is kind of a big deal, even in a world as rapidly changing as our own; secondly, how cities are effectively a cauldron of ideas, as a direct result of my first point. What can our increasingly urban environments teach the organisations we work for about transformation? A few years ago, I came across an article in the Harvard Business Review about Dabbawallas in Mumbai. How to describe this. Think Ubereats, albeit 130 years of age, operating without technology and a centralised structure, in one of the world's most densely populated global cities. Every working day, roughly 5,000 Dabbawallas deliver 200,000 lunches to hungry Mumbaikars on bicycle and foot, whilst ensuring the food stays hot and mistakes are kept to an absolute minimum. Theirs is an enviable service record, at once provided with maximum sustainability and efficiency, albeit without a compromise in levels of performance. In microcosm, the Dabbawalas are testament to how cities, and those who inhabit them, are already smart, without the perceived necessities of big data, sensors and autonomous vehicles. Cities, by their very nature, are large-scale organisms powered by human energy; probably the single greatest example of continuous transformation there is. Mumbai is a continuously transforming city on steroids. Over half of the city's 28m residents live in informal settlements - more widely referred to as slums - or on the streets. The basic assumption regarding slums is that they are lawless and ungovernable fortresses of despair. As such, municipal oversight is often at arm's length and crime is almost an inevitable part of the mix. Yet, despite this, there are manifest examples of slums operating with levels of efficiency unseen even in some of the world's most well-managed organisations. Ciudad Neza, in Mexico City, has become more like a suburb thanks to residents' efforts to build a community and deliver public services from the ground-up. So much so that it is being thought of as a model for other slums. Residents of Orangi Town in Karachi, home to as many people as live in Houston, gave up waiting for the government to install sewers and decided to build them themselves. By hand. Now more than 90% of Orangi Town’s nearly 8,000 streets and lanes have sewerage pipes. Five kilometres from Nairobi city centre is Kibera, which I visited a few years ago. Kibera is thought to be Africa's largest slum, and often used as the focus for NGOs wanting to highlight the desperation felt by slum dwellers everywhere. Most of Kibera's children attend informal schools set up by residents and churches. 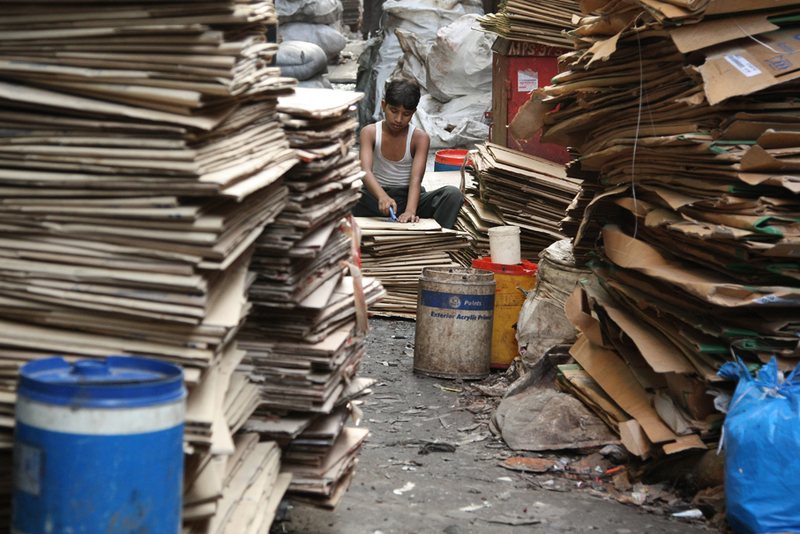 Meanwhile, back in Mumbai, Dharavi, best known as the setting for Slumdog Millionaire, is home to thousands of small businesses, amounting to an informal economy of over a billion US dollars. Chief amongst these is recycling; the ecological powerhouse that is Dharavi reuses 85% of Mumbai's waste material (vs. the UK's 44%), making it, arguably, the recycling capital of the world. The above examples underscore that no matter how dysfunctional you think your own organisation is, far more complex and organic communities in cities are self-organising, bootstrapping innovation and yielding results. From Dabbawallas to the dwellers of Dharavi, my time in Mumbai serves as a stark reminder of this fact. States of chaos often betray a hotbed of contradictions. If nothing works then there's everything to play for. One of the oldest military stratagems - thanks to Sun Tzu's The Art of War - posits that chaos in war presents an infantry with the single greatest opportunity to advance its position. Chaos also means nothing stands still for very long, and in rapidly changing situations, norms are quickly replaced. There's no better environment to test, learn and optimise. Example: The VISA Corporation convinced thousands of banks, each with their own credit card system, to unite under one system in order to compete more effectively for customers. Dee Hock, its founder, coined the term "chaordic" to describe an organisation that finds where chaos and order meet to ensure it thrives under the demands of dynamic business contexts. As slum dwellers illustrate, true agency comes from within. Workers on the proverbial factory or shop floor are usually the first to see or experience problems. They should be empowered and incentivised to play a part in fixing them. The role of the parent organisation in this instance is to set parameters, facilitate new ways of working and provide light governance structures (e.g. guidelines in place of policies). Crucially, this does not replace but underscores the requirement for structured innovation and design specialists, given the need to translate ideas into products and services. Example: DHL, the world’s largest mail and logistics services company, stages scenario-planning workshops with customers and frontline staff in Germany and Singapore, with a view to co-creating solutions to improve customer experience. Of the 6,000 engagements to emerge, some of the more widely reported include the Parcelcopter, a drone delivery service trialling in Germany; augmented reality devices, developed with DHL customer Ricoh, to improve inventory and warehouse picking efficiency; and Maintenance on Demand (MoDe), co-created with DHL customer Volvo Trucks, which uses sensors to track and report vehicle component performance within its truck fleet. In an ideal world, those in operational roles would work in tandem with those in strategic control in order to form a pincer movement around the organisation. This would embed new ways of working in long-term thinking. That said, if I had to choose one over the other, I'd select a bottom-up approach every time. Management by decree or, at best, a strong vision that fails to capture the imagination of the workforce, makes a strong candidate for failure. Also, history tells us that, more often than not, successful revolutions emerge from the proletariat. Example: The city of Detroit holds a definitive place in 20th century creative innovation, from the invention of the automobile to the invention of an entire genre of music. After the economic crash of 2008, the city underwent rapid depopulation due to foreclosures and a lack of jobs. Since, the city's inhabitants have driven Detroit Future City, a community-led regeneration plan that has gone from standstill to a critical mass of grassroots initiatives, from self-build projects to urban farming initiatives. Meanwhile, city managers, for their part, have faced wave after wave of criticism in relation to redevelopment disparities in Detroit, which are focused on only 7 square miles. This has left the other 95% of the city largely untouched by municipal bodies, in terms of broader efforts to spur economic growth and create opportunities for residents. Understanding that something is wrong does not automatically inspire droves to mobilise in a bid to fix it. Often, problems are known for some time before a solution is arrived at. The tipping point usually kicks in when enough people feel strongly enough to upended the status quo, or when there's an opportunity cost in not doing anything. In each case, amassing ideas and effort across the board can act as a galvanising catalyst for action, but many collaborative efforts fail. Example: In an attempt to understand the DNA of collaboration in its own organisation, Google launched Project Aristotle. What it found was neither quantifiable or codified. The best teams don’t have a structured approach to collaboration, they have an unwritten social code based on equity of voice, where everyone engages in “conversational turn-taking”. Remember that order can often arise from what others perceive as chaos, especially if norms are constantly changing. The individuals closest to the root a problem are uniquely situated to co-create a solution, whose impact can be further leveraged if universal parameters are set, new ways of working are developed and governance established. If top-tier support is not forthcoming, do it anyway; bottom-up evolution works better than top down revolution. Lastly, whilst necessity is the mother of invention, good collaboration is the key to its survival. Mumbai is in the midst of the wettest monsoon rains in over a decade so, no doubt, instances of micro-transformation and rapid innovation are taking place minutes away. For my part, I now intend to close this keyboard and get out into the city to witness it, first hand.